Crabapple Dental is pleased to offer cosmetic dermal fillers to the residents of Alpharetta and the surrounding areas. 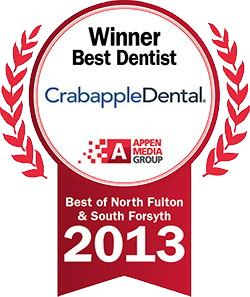 We are a full service dental practice that is conveniently located in downtown Crabapple. 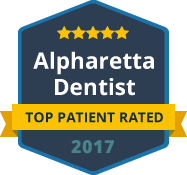 We serve the residents of Alpharetta and the surrounding areas with top quality preventative, general, restorative and cosmetic dental care. Our passion is creating the smile you were meant to have, one that is attractive, confident and beautiful! Our dental practice offers Juvederm®, a smooth gel filler that can be used to smooth away wrinkles around your mouth and nose. It can be used to treat smiles lines, Marionette Lines or Verticle Lines on your face. With just one treatment, you can get smooth and natural-looking results that last up to a year. Our cosmetic dentist, Dr. Sarah Roberts, is highly trained and experienced in providing Juvederm® injections. As a cosmetic dentist, Dr. Roberts is uniquely qualified to provide treatments to enhance the appearance of the face. Using this innovative treatment, she is able to achieve amazing results for our patients. We offer Juvederm® dermal fillers at competitive prices and we guarantee our results. Juvederm® facial fillers are the perfect way to frame a beautiful smile and can help you to achieve smoother skin and a more youthful appearance. If you are interested in enhancing the appearance of your smile, please contact our Cosmetic Dermal Fillers Professionals at Crabapple Dental today to schedule a free smile consultation. Our practice is currently accepting new patients and we would appreciate the opportunity to serve you and the members of your family. We look forward to helping you achieve an attractive, confident, beautiful smile!